Carman Vibrating Bin Dischargers eliminate hopper flow problems including bridging and ratholing by using vibratory action to promote bin flow for many materials with challenging flow properties. Individually engineered for each application, the unique design of the Carman Vibrating Bin Discharger allows easy installation with the ruggedness to stay on-line. To ensure proper application, Carman engineers carefully analyze the flow properties of your product or raw material in our laboratory or with rental equipment in your facility. 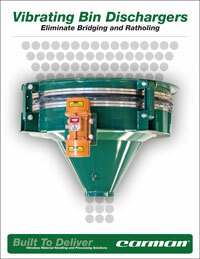 Performance of a Carman Vibrating Bin Discharger is guaranteed. A no-flow condition in which the headload of the stored material results in a “bridge” or “arch” formation in the bin or the hopper section of the bin. A condition in which the stored material does not slough into the central flow stream for discharge and instead forms a core. Problems associated with ratholing include flooding, substantial variation of density in product, and eventually, no-flow. The Carman Vibrating Bin Discharger eliminates ratholing by increasing the effective hopper outlet size while the unit’s internal pressure cone eliminates bridging. With identical elevations and bin diameters, a 60 degree bin with a 5 foot Carman Vibrating Bin Discharger provides 130% more hopper volume than a 70 degree static hopper.